just in case the smock gets "left behind" . 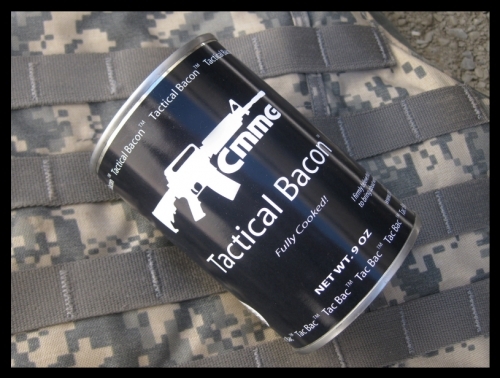 . .
according to the website, CMMG Tactical Bacon has at least a ten year shelf life and is perfect for camping, hunting, zombie standoffs, and end of the world scenarios. i say, at only $15.95 a can, this is the perfect christmas smockstocking stuffer. hint-hint, mamas! Alicia @ Fructus Ventris blog said I should direct my question to y'all. I am looking for a catholic/nfp only midwife in the dfw or surrounding area. Do y'all know of one or another contact I could try? Any help would be greatly appreciated! My midwife is wonderful & pro-life but not nfp only or Catholic. I can ask on the HAND list though and i'll get back here if I find out about anyone. Thank you, Aisling! It was YOU I was going to ask! Hi Gen! I'm sending you an email with a list of names of Catholic midwives in the area that Aisling was able to rustle up for us. I'm not sure if all are NFP-only, but it gives you a place to start. Let us know if one of them works out! the smock's family practitioner is the only NFP-only family practice doctor in Arlington and he is wonderful. he may know someone he can refer. email me, aka smock, at callmicki4avon@aol.com for his information. This page contains a single entry by smockmomma published on September 10, 2009 12:04 PM. why aren't priests like this run out of town on a rail ... or whatever it takes to shut them up? was the previous entry in this blog. Now, if it were just Coke Zero...... is the next entry in this blog.